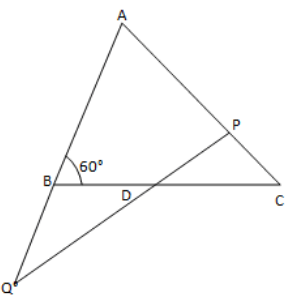 Also, name the interior opposite angles to an exterior angle at A. In the fig, two of the angles are indicated. What are the measures of ∠ACX and ∠ACB? In a triangle, an exterior angle at a vertex is 95° and its one of the interior opposite angles is 55°. Find all the angles of the triangle. We know that the sum of interior opposite angles is equal to the exterior angle. We also know that the sum of all angles of a triangle is 180°. One of the exterior angles of a triangle is 80°, and the interior opposite angles are equal to each other. 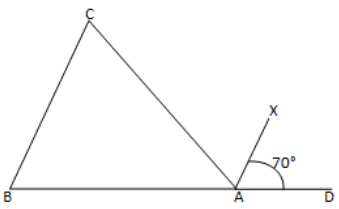 What is the measure of each of these two angles? 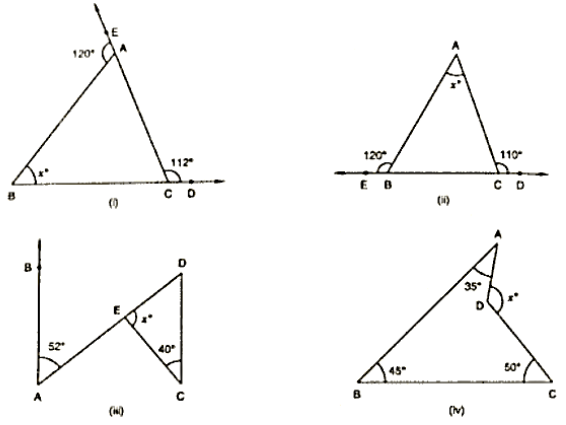 Let us assume that A and B are the two interior opposite angles. We know that ∠A is equal to ∠B. We also know that the sum of interior opposite angles is equal to the exterior angle. Thus, each of the required angles is of 40°. 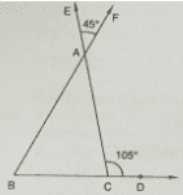 The exterior angles, obtained on producing the base of a triangle both ways are 104° and 136°. Find all the angles of the triangle. In the given figure, ∠ABE and ∠ABC form a linear pair. We can also see that ∠ACD and ∠ACB form a linear pair. 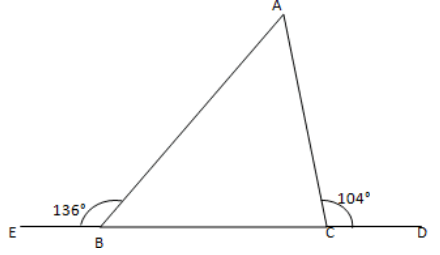 In a ∆ABC, ∠BAC and ∠EAF are vertically opposite angles. 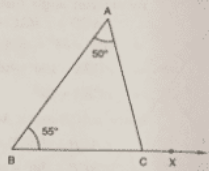 Therefore, the angles are 45°, 65° and 75°. In Figure, AC perpendicular to CE and C ∠A: ∠B: ∠C= 3: 2: 1. Find the value of ∠ECD. In the given triangle, the angles are in the ratio 3: 2: 1. Let the angles of the triangle be 3x, 2x and x. 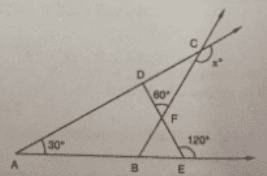 A student when asked to measure two exterior angles of ∆ABC observed that the exterior angles at A and B are of 103° and 74° respectively. Is this possible? Why or why not? It means that the sum of internal angles at A and B is greater than 180°, which cannot be possible. In Figure, measures of some angles are indicated. Find the value of x. We know that the sum of all angles of a triangle is 180°. 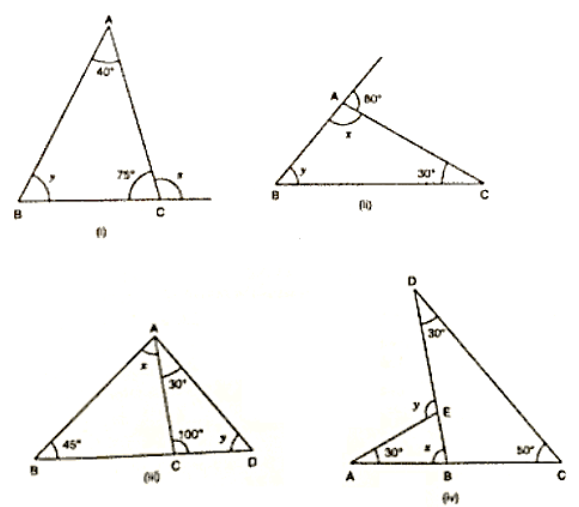 (ii) We know that the sum of all the angles of a triangle is 180°. ∠BDE + ∠BED + ∠DBE = 180°. 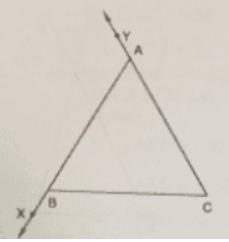 ABC is a triangle in which ∠B = ∠C and ray AX bisects the exterior angle DAC. If ∠DAX = 70°. Find ∠ACB. ∠ACD and ∠ACL make a linear pair. ∠ABD and ∠QBD form a linear pair. The interior angles of a triangle are the three angle elements inside the triangle. The exterior angles are formed by extending the sides of a triangle, and if the side of a triangle is produced, the exterior angle so formed is equal to the sum of the two interior opposite angles. Using these definitions, we will obtain the values of x and y. 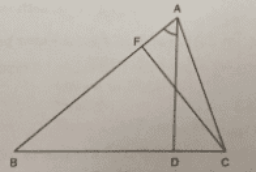 (iii) We know that the sum of all angles of a triangle is 180°. 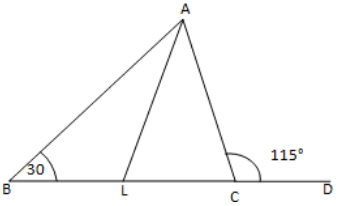 (iv) We know that the sum of all angles of a triangle is 180°. We know that the sum of all the angles of a triangle is 180°. (iv) In the given figure, we have a quadrilateral whose sum of all angles is 360°.